Looking for an apartment home near Lake Nona's Medical City? Camden LaVina has one, two or three bedrooms that are just what you are looking for! You will love all of the interior features including the full-size washer and dryer. Cook up a delicious meal in your gourmet kitchen with stainless steel appliances and 42-inch espresso cabinets that are perfect to hold all of your kitchen accessories. Enjoy spacious walk-in closets and relax in your garden bathtub. Need a little extra storage for your belongings? Some of our private patios come with a storage closet and we have detached garages that are only steps from your apartment. Picture yourself relaxing poolside or under one of our shady cabanas enjoying the Florida weather. Show off your pitmaster skills at the outdoor grills and enjoy your lunch on our veranda with plenty of outdoor seating for you, your family and friends. Need to beat the heat? Our clubhouse has a pool table, shuffleboard and a theater room with movies and a gaming station that you will love! You can also stay in shape at our 24-hour high-endurance fitness center with plenty of cardio equipment and free weights. Camden LaVina is a pet-friendly community where your four-legged friend will love to live! Your pets will love the beautifully landscaped grounds and the off-leash dog park where they can run and play with some their new friends! You will love our pet washing station. It is a perfect place to fluff and dry your pup! Need a place for boarding, day camp or grooming? Pet Paradise is only a few minutes away from our community. 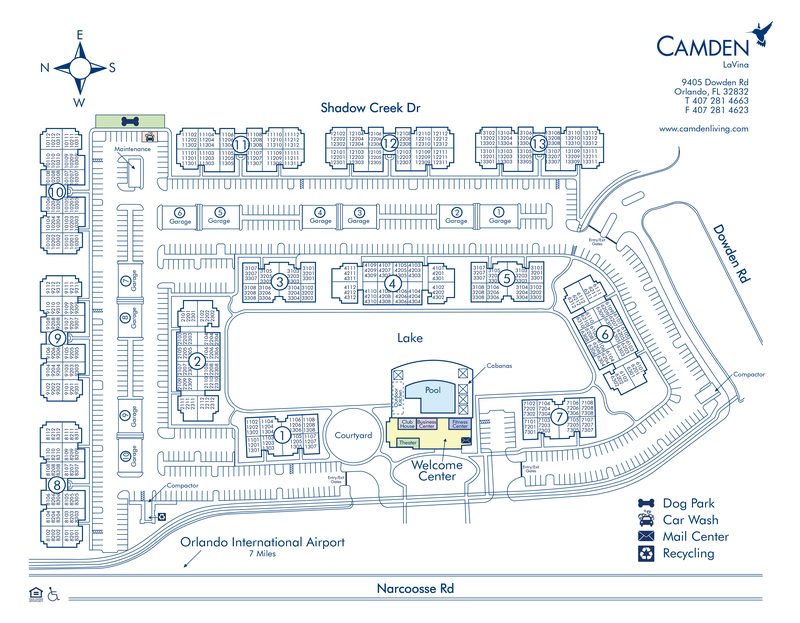 Conveniently located in the Lake Nona area off of Narcoossee Road, Camden LaVina is perfect for any commuter. With easy access to the Beachline Expressway (528) and Florida State Road 417, you can be anywhere in Orlando quickly. Work in Medical City? We are only minutes away! If you travel frequently for business or pleasure, you are in luck! The Orlando International Airport is only ten minutes away which can whisk you away to hundreds of destinations across the world! Love to be outside? We have three golf courses nearby and we are near Moss Park where you can camp, boat, run the trails or enjoy the playground with your children. For entertainment and good food, take advantage of the short walk to Nona Tap Room and enjoy all that the LaVina Marketplace has to offer! Have kids? They will be able to attend top rated schools within our area. Sun Blaze Elementary, Innovation Middle School, and Lake Nona High School are all Florida rated “A” schools. Residents also receive a technology package through Spectrum, included in their total monthly rent. This money-saving package includes high-speed internet with speeds up to 60 Mbps, WiFi, and more than 300 digital channels with over 100 in HD. Come home to Camden LaVina and love where you live. Call today to make an appointment to see your beautiful new apartment home! At Camden, your pets are family too! We welcome cats and dogs, up to two pets per apartment home with no pet weight limit. Call us with any pet-related questions! Get the perfect spot! We have ample parking for our residents on a first-come, first-served basis. Detached garages are available for $125 per month.